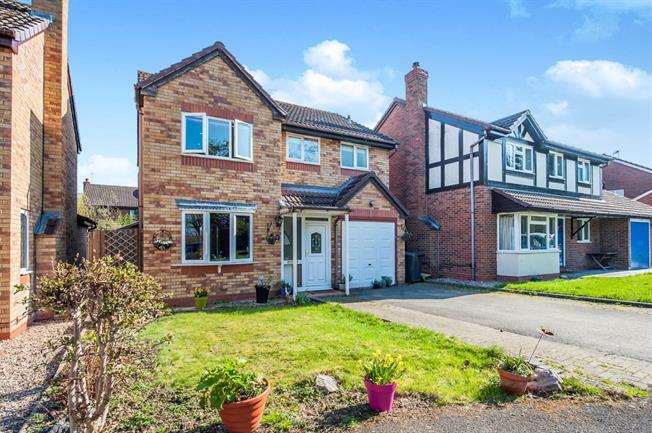 4 Bedroom Detached House For Sale in Stratford-upon-Avon for Guide Price £350,000. A spacious four bedroom detached family home positioned in a popular established position set behind a private road. Allowing easy access to the train station, motorway links and the town centre. The accommodation is well presented throughout and makes an ideal home for any family. The accommodation allows; entrance hall, sitting room, conservatory, dining room, kitchen, (potential to create a open plan breakfast kitchen) utility and cloakroom. Upstairs is a generous master bedroom with built in wardrobes and an en-suite. Three further bedrooms and a bathroom. Outside is a mature garden, garage and driveway allowing parking for three cars. Sold with no onward chain. Viewing is essential. Accessed via a UPVC door. Stairs rising to the first floor. Double glazed window to the front elevation. Gas coal effect fire. Radiator. Wood floor. Doors to the conservatory. Radiator. French doors to the garden. Wood floor. Ceiling light and fan. A range of matching wall and base units including roll edge work surfaces incorporating a stainless steel sink and drainer unit. Integrated is a five ring burner gas hob and electric oven. Further fitted is a fridge freezer and dishwasher. Tiling to the walls and floor. Pantry cupboard. Double glazed window to the rear elevation. Wall and base units including a stainless steel sink and drainer unit. Space for a washing machine. UPVC door to the side elevation. White suite allowing a low level w.c and wash hand basin with tiled splash back. Double glazed obscure window to the side elevation. Radiator. Wall mounted boiler. Two double glazed window s to the front elevation. Two double and one single built in wardrobes to one wall. Further built in double wardrobe. Radiator. White suite allowing a low level w.c, wash hand basin and shower cubicle. Tiling to the walls and floor. Double glazed obscure window to the front elevation. Heated towel rail. White suite allowing a low level w.c, wash hand basin and bath with shower over. Airing cupboard housing the hot water tank. Double glazed obscure window to the side elevation. Heated towel rail. Lawned garden with planted borders. Enclosed by fencing with side gated access.